Blog posts have been in short supply here as I have been preparing for the 2012 Gentian Garden Tour which is a fund raising event for my garden club. 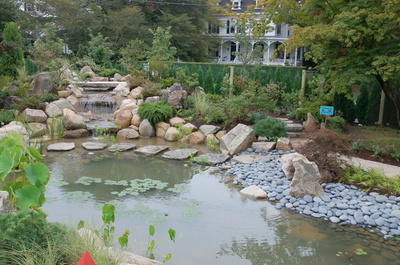 Ten gardens in Scituate and Foster, RI were on tour on Saturday. The week prior to the date was clear, sunny and warm and towards the end of the week even the humidity dropped. The gardeners all primped and planted, edged and mulched and prior to Saturday over 200 tickets had been sold. Alas, heavy rain came in early on Saturday morning. Not just a mist, but a gusher with almost two inches of rain falling during the day. Most of the rain was confined to the morning with a bit of tapering off occurring about five hours in the middle of the day. It is a good thing that most garden lovers are hardy. Umbrellas, raincoats and boots were the order of the day as almost 100 brave souls toured my garden. My friends across the road, The Dynamic Duo - Brenda and Rocky, also had their garden on tour which helped attract the crowds to this gravel road to nowhere but our homes. The 'Pink Chimes' Styrax japonicus had been damaged in an early snowstorm last year. The heavy snow load bent the main trunk as the tree still carried its leaves. It did return to an almost upright position until this heavy rain on the numerous blooms caused it to bend to greet the garden guests on Saturday. It formed a bower of flowers at the entry to the left front border. Many perennials have bloomed early this season which created a bit of concern. No one really knew what would be in bloom on the appointed tour day. No matter, the garden visitors roamed the borders at their leisure. Most had an umbrella and few were concerned by the weather. The Allium bulgaricum aka Nectaroscordum siculum ssp. bulgaricum was in full bloom as was the Hydrangea anomala petiolaris climbing the oak tree in the entry garden. The borders were polished by the rain which served to wash the leaves of a heavy coating of yellow pine pollen. The patio umbrella glowed in the grayness of the day and the climbing roses bloomed early to echo the umbrella color. The garden looked as proper as it ever has thanks to many helping hands this year. I would say the work in the garden is done for the season but all gardeners know this is never true. The rain has already encouraged more latent weed seeds to germinate so I will be out there weeding a bit and finishing up in the vegetable garden which has taken a back seat to borders this year. 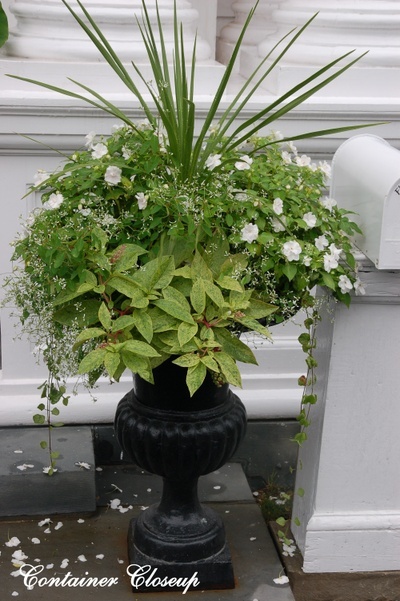 There will be deadheading and pinching and maybe even a bit more planting. Mother Nature may not have cooperated with our garden club concerning this tour but she really did not keep away the most avid garden lovers. I do wish you had been here but if you wish a short, up close and personal tour of the left front border, you can check out this video. I will be posting more videos as it is very difficult to show a garden in its entirety in still pictures. I was away from my garden last week. It is hard to leave in June when all plants are lush, full and show no symptoms of decline. It is a fleeting time in the garden. July often brings dry weather and bugs but June is glorious. 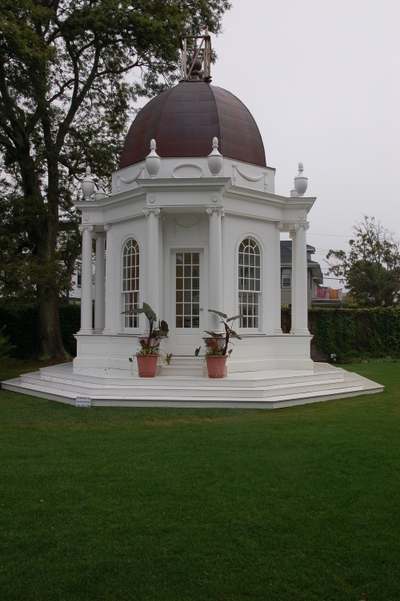 It is also the time when garden tours abound and this one took me to Essex, England. I know, I am very lucky. Traveling to other gardens gives knowledge, persepective, enjoyment, angst (my garden does not measure up), and new enthusiasm. The group I traveled with was pure fun. 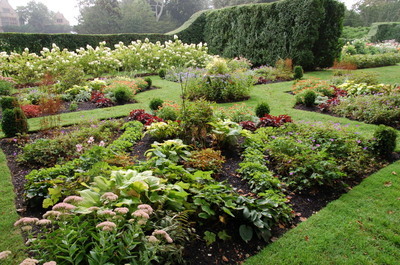 People who love to garden or love to look at gardens. More about this at a later time. The highlight of my trip was a visit to the garden of one of my gardening heroines, Beth Chatto. Her book 'Green Tapestry' has been on my shelf and in my hands since it was published in 1989. It has been a long valued gardening resource. I am still trying to absorb her teachings. Her whole premise for gardening is based on ecology. The ecology of understanding where plants grow in the world, what type of soil in which they thrive and then placing them in the appropriate setting in her garden. This is common sense. I have thrown it aside on many occasions when plant lust has taken over. Many of us are guilty of this. Beth Chatto is a skilled veteran in the garden and, as such, her wisdom and experience which is so evident in the beauty she has created holds much weight. 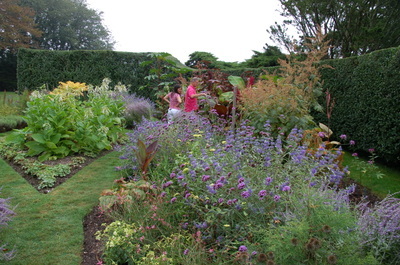 You can read more about Beth Chatto's garden here. East Anglia, where this garden is located, receives about twenty inches of rain per year. It has been dry there this year but this garden, with its crunchy gravel surface, looks divine. Our group entered the garden, as all do, through the dry garden. It is a large area and there are many interesting and unknown plants to enjoy. The path meanders through a level section of the garden. Grasses provide vertical, filmy curtains to entice the visitor through the paths. David was an interesting and informative guide telling us that 'Beth Chatto "paints the sky as well as the ground' with plants. The transition from the dry garden to the lower lush garden with the bog, walks, pond and borders takes one down steps under the shade of large trees. The temperature is cooler and the green lushness a distinct contrast to the burnished copper and bright sun of the gravel garden. As we rounded a corner with our guide, David, there was Beth Chatto giving exacting pruning instructions to one of her gardeners. He had pruners in hand and was listening intently as was I. David asked if she had time to speak to our group and she graciously gave us a few moments of her wisdom. She discussed the problems of climate change in her garden and said that in 'the last ten years, there has not been enough ice on the pond to bear a duck'. I am really not embarrassed to say that I angled around behind her so that a friend of mine could get me in the same frame. After all, she is my gardening heroine. What resulted was a series of 'Where's Waldo' shots with Beth Chatto in the foreground with a rather looming, 'out of focus' me in the background. That is as it should be. I am not quite in focus with my gardens or in life yet but perhaps if I am lucky enough to reach Beth Chatto's age of experience the edges will become more distinct. 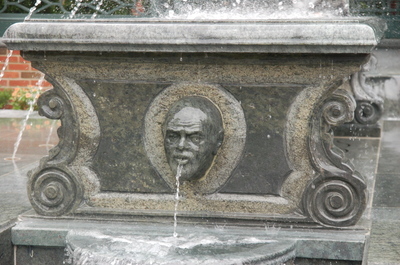 Oh to have a fountain such as this one! 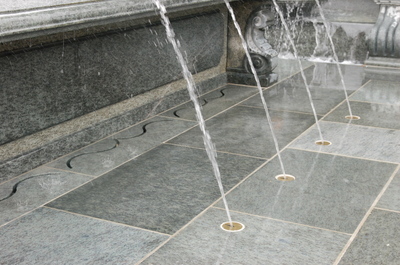 Water spitting from many jets below, up on the table of Pomona, down the center of the granite table, through the spitter and then under the bridge and on toward the rill garden. Such masterful design! I love the mosaics lining this channel. 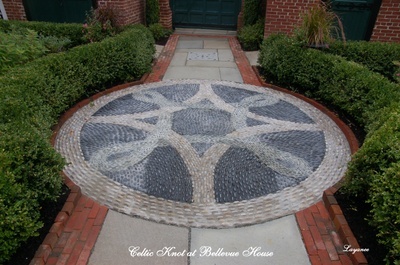 They are also used in this Celtic knot in the formal box garden. The front door is welcoming with its' elegantly planted cast iron urns. Here is a closeup which shows the plants and includes the variegated pokeweed. Isn't it curious how such and inelegant weed gains notoriety once the leaves become speckled and splotched. For those of you who have to take down a massive tree, consider carving the trunk. 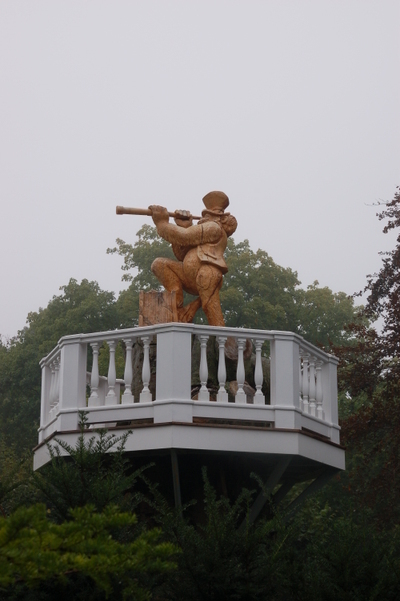 This beech tree has new life as a carved monkey and, a monkey with a spyglass to boot! Why didn't I think of that? 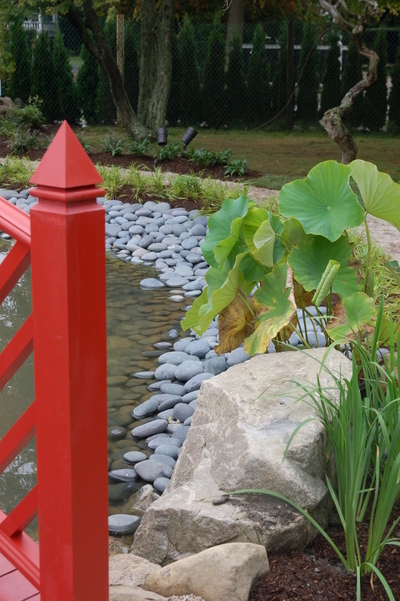 In addition to the rill garden there is a new pond garden complete with Japanese bridge and plantings. The pond reflects this structure. I am not sure why I did not take that reflection. I was trying to absorb the landscape here in the hub of Newport along upper Bellevue Avenue. This is an evolving garden and a lived in home. Thanks go out to the owner, Mr Fleming, for the personal tour and for opening his garden so that we could have a glimpse of the beauty behind the gates. This weekend, Hannah, reared her wet head and left us with over four inches of rain. 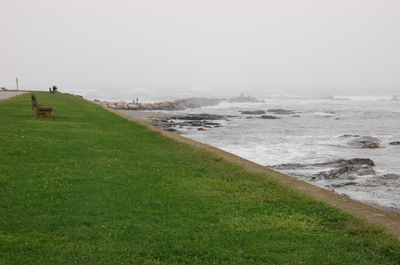 Fortunately for those who ventured out for the Newport Secret Garden Tour, the wildest, wet weather occurred in the early hours of the morning and the late hours of the day leaving tour times humid and overcast. Much better for picture taking. Since I live as far inland as you can get in Rhode Island, I always appreciate the chance to visit the ocean which is within an hour's drive and Newport is a world apart in many ways. 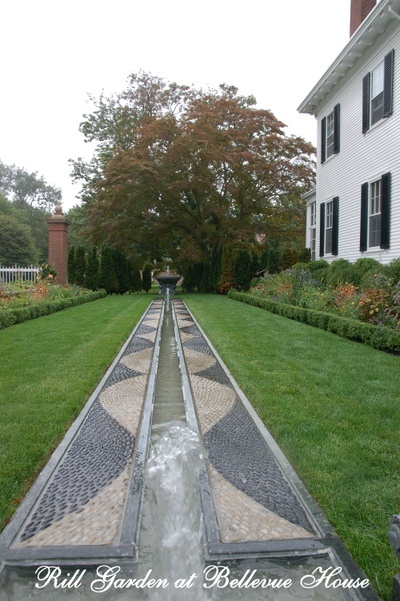 Bellevue Avenue is the home address of many of the private gardens available for viewing on the tour. Former summer homes of Rockefellers, Vanderbilts, and Doris Duke, line the Avenue and it is the current home of many generous garden lovers. The gardens at Rough Point, Duke's estate are well hidden behind yew hedges and this property looks out on the ocean from a point high above the surf. 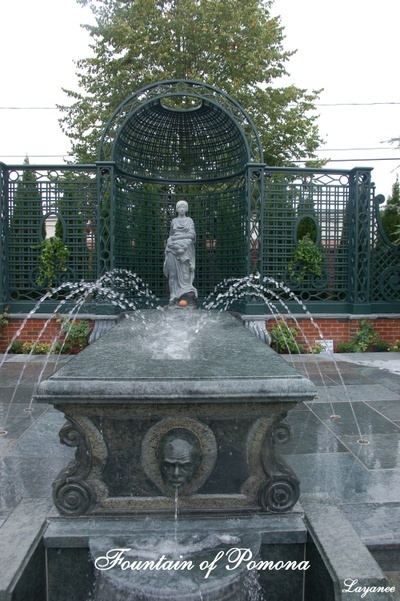 The estate was bequeathed to the Newport Restoration Foundation upon Duke's death in 1993. 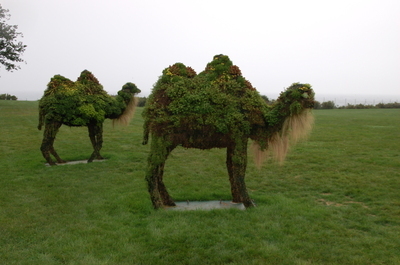 The topiary camels are standing sentry in the wide expanse of a lawn which must seem very unfamiliar to them. They are planted with sempervivums and sedums and sport a grass ruff. I am trying to figure out how to build my own animal out of chicken wire and rebar. I think it is a job for the Equipment Manager! 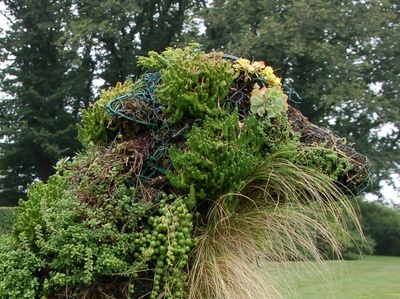 If you were to have a large topiary in your yard, which animal or creature would you choose?